Department of Otorhinolaryngology-Head & Neck Surgery, School of Medical Sciences, Universiti Sains Malaysia Health Campus, 16150 Kota Bharu, Kelantan, MALAYSIA. Department of Medical Microbiology & Parasitology, School of Medical Sciences, Universiti Sains Malaysia Health Campus, 16150 Kota Bharu, Kelantan, MALAYSIA. Kaffir lime (Citrus hystrix D.C) has been used for a long time in agricultural and alternative medicine. Kaffir lime leaf (KLL) had been proved effective against certain fungi that could infect human body. To study the antifungal effect of KLL extracts on Aspergillus niger and Candida albicans. This is a laboratory-controlled prospective study conducted in Universiti Sains Malaysia. KLL was extracted with 70% ethanol and aqueous via Soxhlet extraction method. The concentrated extract then freeze dried to obtain powdered form which was diluted to establish five different concentrations of 50 g/ml, 25 g/ml, 12.5 g/ml, 6.25 g/ml and 3.125 g/ml. Sabouraud Dextrose Agar (SDA) lawned with tested fungal isolates were inoculated with the extracts using well-diffusion method. Zone of inhibition was measured followed by minimum inhibitory concentration (MIC). There were presences of zone of inhibition for both aqueous and alcohol KLL extracts on Aspergillus niger and Candida albicans growth. KLL aqueous extract have bigger mean of inhibition as compare to alcohol extract against Aspergillus niger. In contrast, KLL alcohol extract have bigger mean of inhibition as compare to aqueous extract against Candida albicans. The MIC of KLL aqueous extract against Candida albicans was 12.02 g/ml, alcohol extract against Candida albicans was 10.23 g/ml, KLL aqueous extract against Aspergillus niger was 47.86 g/ml and alcohol extract against Aspergillus niger was 48.97 g/ml. Conclusion: KLL has significant antifungal effect towards pathogenic fungi causing otomycosis, particularly Aspergillus niger and Candida albicans. When choosing the correct topical antifungal drugs, certain factors should be considered such as water soluble, low risk of ototoxicity, low allergic effect, a broad spectrum antimitotic drug, suitable for application on pediatric patients, and commercially available.15 There were very limited publications on antifungal effect of KLL especially to Candida albicans and Aspergillus niger. Hence, in this study, we are considering the antifungal properties of KLL extracts towards pathogenic otomycosis, particularly Aspergillus niger and Candida albicans. This is a laboratory-controlled prospective study. It was fully conducted under a well-controlled environment in the Medical Microbiology and Pharmacology laboratories in the School of Medical Sciences, Universiti Sains Malaysia (USM). This study has been approved by the Human Ethics Committee of USM. KLL were collected from a single area, prepared for USM herbarium identification (voucher reference number 11538). The remaining KLL were washed with distilled water and dried in oven at 45°C for two days. Dried KLL leaves should maintain the original green colour. Then, the dried leaves were grinded using leaf grinder machine to smaller course powder form and stored in tightly sealed glass container. The method of choice for extraction was the Soxhlet extraction by using Soxhlet apparatus. This uses a solvent for extraction and at completion the solvent will be fully removed. We used two types of solvent, which was aqueous and ethanol 70%. The dried powder form of the tested leaves was inserted into the Soxhlet thimble and closed with white thin gauze. The thimble was inserted into the Soxhlet main chamber and closed. The solvent chamber was filled with ethanol 70% 1 litre, and attached to Soxhlet apparatus. Solvent chamber should not be overfilled and the volume of solvent in the vessel should be 3 to 4 times the volume of the Soxhlet chamber. The solvent chamber was heated and solvent vapour travels up a distillation arm, and fills into the main Soxhlet chamber. The condenser ensures that any solvent vapour cools, and drips back down into the chamber housing the powder. Some of the desired compound was then dissolved in the warm solvent. When the Soxhlet chamber was almost full, the chamber was automatically emptied by a siphon side arm, with the solvent running back down to the distillation flask. This extraction allowed for 4-6 cycles. By 6th cycle, the solvent chamber was dark in colour and Soxhlet chamber was clearer. The solvent with desired compound was extracted and in solvent chamber. The extracted leaves in alcohol solvent then evaporated with rotary evaporator. The volume of extract was concentrated till 50 ml and inserted into multiple sterile containers. It was freeze dried to avoid further heat damage on a freeze dryer machine. For water solvent, same process done whereby the ethanol was replaced with distilled water in solvent chamber. This powder form extracts were used to establish different concentrations as required in this study. The concentrations required were 50 g/ml, 25 g/ml, 12.5 g/ml, 6.25 g/ml and 3.125 g/ml. Initial 100 g mixed with two ml of distilled water to produce 50 g/ml concentration. Then one ml from the 50 g/ml concentration taken and distilled water added till two ml level to make 25 g/ml concentration. Similarly, one ml was taken from 25 g/ml concentration to make up 12.5 g/ml. The dilution continued till 3.125 g/ml concentration. The left-over extracts were discarded and a new preparation done for new replicates. The fungal isolates were taken from archives of microbiology laboratory in School of Medical Sciences, USM, which already been identified earlier from patients of otorhinolaryngology clinic. Both Candida albicans and Aspergillus niger was used as tested fungi. Candida albicans from SDA plates were suspended in sterile distilled water and adjust to 106 cells with colony forming units (CFU)/ml9 (0.5 McFarland standard). Nephelometer was used to adjust the turbidity of fungal suspensions so that the number of fungal was within a given standard McFarland range. Similar process done for Aspergillus niger. The suspended sterile fungal organism labelled and used for the next step to lawn and prepare for testing in SDA plates. Within 15 min of diluting the organism, sterile swab was dipped into the properly adjusted inoculums of tested fungal organism. The sterile swab was slightly lifted, and then the swab was firmly rotated several times against the upper inside wall of the tube to express excess fluid. The plate was open slightly to lawn the fungal organism. Later, by using glass pipette, four wells were created in four quadrants. The SDA plate was kept lid side up in a 30°C incubator. Before inserting in an incubator, micropipette was used to drop 100 microliters of extracts into wells. The upper quadrant well, the aqueous KLL extract was inserted with its aqueous control at opposite site. The lower quadrant well, the alcohol extracts was inserted with its alcohol control at opposite site (Figure 1A & 1B). This was done using different concentration which was diluted prior to this. Five different replicates were done. The plates were examined every day to make sure no spillage or growth of other organism. The measurement was done on third day whereby this was the perfect time to visualize the margin of inhibition. After the third day, there was overgrowth especially the Aspergillus niger which may jeopardize the safety of the staff. Measurement was done of zones showing complete inhibition by gross visual inspection. Minimum inhibitory concentration measured by agar diffusion method to determine MIC of each tested KLL extracts. After measurement of all the result, a scattered plot graph X2 Versus Log Concentration was plotted. A linear line represents the mean value was drawn and the area where X2 equal to zero was taken for the MIC level of the extract. Antilog of the selected value was mathematically identified as MIC. The X value represent the zone of inhibition diameter subtract the well diameter and divided by two. Zone of inhibition which is the clear zone where growth of fungal does not occurred was measured for each tested KLL extracts. There was zone of inhibition for both aqueous and alcohol KLL extracts after three days of incubation on Candida albicans. Similarly, Aspergillus niger growth was inhibited in aqueous and alcohol KLL extracts. However, not all concentrations of extracts effectively inhibited the growth in both pathogens. Aspergillus niger was inhibited only in the highest concentration at 50 g/ml in both aqueous and alcohol KLL extracts. 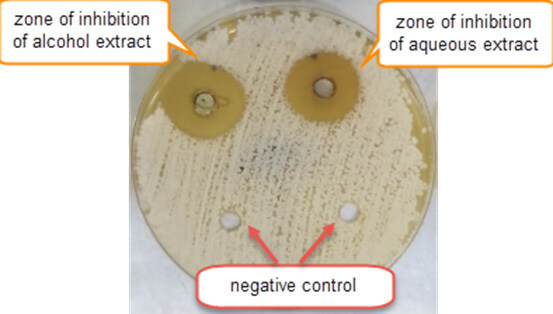 All samples revealed negative control (wells contain either only alcohol or only aqueous) showed no zone of inhibition against Aspergillus niger and Candida albicans. Aspergillus niger showed sensitivity to both aqueous and alcohol KLL extracts (Table 1A). Growth of Aspergillus niger inhibited in KLL alcohol and aqueous extract in concentration of 50 g/ml. However, the growth was resistance to concentration from 25 g/ml, 12.5 g/ml, 6.25 g/ml and 3.125 g/ml. One replicate of samples at different concentrations whereby aqueous KLL extract tested at right upper quadrant of petri dish and alcohol KLL extract tested at left upper quadrant of each petri dish (Figure 2A). Mean zone of inhibition is higher in extract concentration of aqueous compared to alcohol. 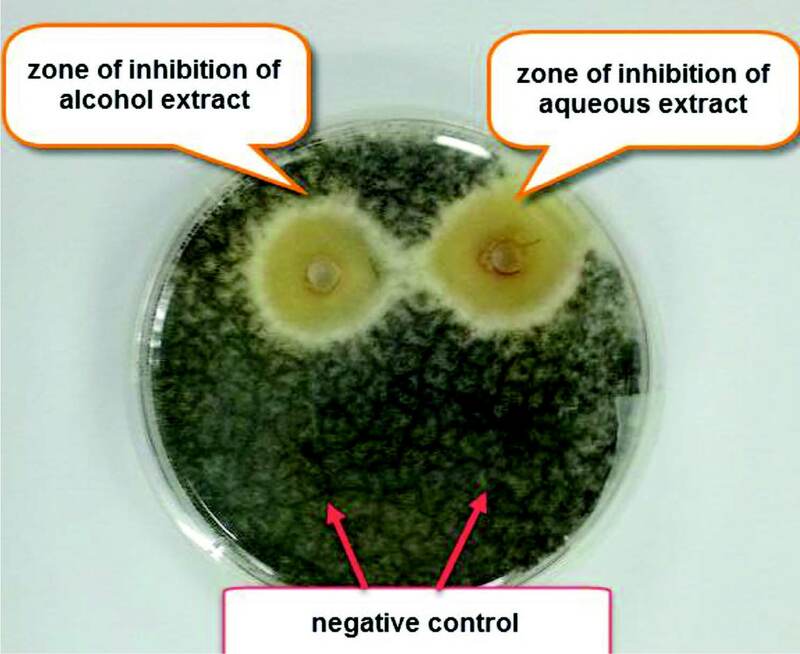 Positive zone of inhibition against Aspergillus niger with negative control in kaffir lime leaf aqueous and alcohol extracts at 50 g/ml concentration. Positive zone of inhibition against Candida albicans with negative control in aqueous and alcohol extract at 12.5 g/ml concentration. Comparison between antifungal activity of KLL aqueous and alcohol extract against Aspergillus niger demonstrated that antifungal activity in aqueous KLL extract is better than alcohol KLL extract. In concentration 50 g/ml, zone of inhibition of aqueous KLL extract was bigger as compared to alcohol KLL extract (Table 1B). Independent t-test showed aqueous extracts has bigger mean of inhibition as compared to alcohol extract against Aspergillus niger (p<0.001). Ninety five percent confidence interval of mean difference of inhibition does not include zero. Therefore, statistically antifungal activity of Aspergillus niger is better in aqueous KLL extract than alcohol extract. Candida albicans showed sensitivity to both aqueous and alcohol KLL extracts (Table 2A). Growth of Candida albicans was inhibited in KLL alcohol and aqueous extract concentrations of 50 g/ml, 25 g/ml and 12.5 g/ml. One replicate of samples at different concentrations whereby aqueous KLL extract tested at left upper quadrant of petri dish and alcohol KLL extract tested at right upper quadrant of each petri dish (Figure 2B). Mean zone of inhibition increase in proportion to extract concentration. One replicate of samples showing zone of inhibition of kaffir lime leaf extracts on Aspergillus niger growth at 5 different concentrations. One replicate of samples showing zone of inhibition of kaffir lime leaf extracts on Candida albicans growth at five different concentrations. One-way ANOVA showed significant mean differences between groups of concentration for aqueous KLL extracts (Table 2B). Mean zone of inhibition of concentration 50 g/ml was 27.20 mm, 25 g/ml was 17.20 mm and 12.5 g/ml was 11.00 mm with significant difference between the three groups (p<0.001). Post-hoc comparison showed significant difference in 50 g/ml vs 25 g/ml (p<0.001), 50 g/ml vs 12.5 g/ml (p<0.001) and 25 g/ml vs 12.5 g/ml (p<0.001) (Table 2C). The higher KLL aqueous concentrations gave high effect to mean of inhibition of growth of Candida albicans. 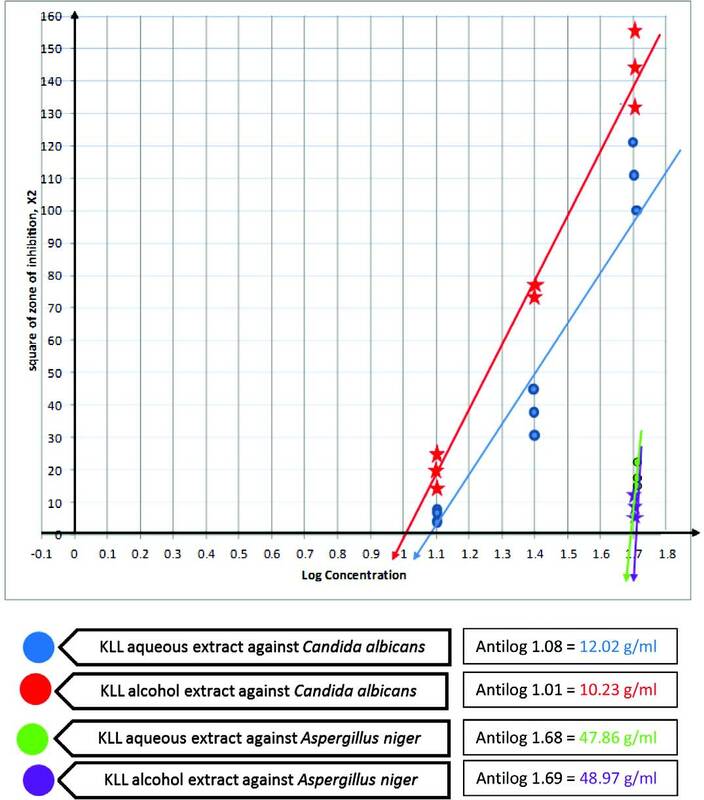 One-way ANOVA also showed significant mean differences between groups of concentration for alcohol KLL extracts against Candida albicans (Table 2D). Mean zone of inhibition of concentration 50 g/ml was 30.00 mm, 25 g/ml was 23.40 mm and 12.5 g/ml was 13.80 mm with significant difference between the three groups (p< 0.001). Post-hoc comparison showed significant difference in 50 g/ml vs 25 g/ml (p< 0.001), 50 g/ml vs 12.5 g/ml (p<0.001) and 25 g/ml vs 12.5 g/ml (p<0.001) (Table 2E). Therefore, statistically one-way ANOVA showed significant mean differences between group of concentration for both alcohol and aqueous KLL extracts against Candida albicans with p<0.001. Comparison between antifungal activity of KLL aqueous and alcohol extract against Candida albicans demonstrated that both alcohol and aqueous KLL extracts showed significant antifungal activities towards Candida albicans with widest zone of inhibition was 30 mm in alcohol extract. Antifungal activity in alcohol KLL extract is better than aqueous KLL extract. In each concentration of 50 g/ml, 25 g/ml and 12.5 g/ml, zone of inhibition alcohol extracts was more as compared to aqueous extracts (Table 2F). Independent t-test showed that alcohol extracts has bigger mean of inhibition as compared to aqueous extract in all three concentrations against Candida albicans (p<0.001). Ninety five percent confidence interval of mean difference of inhibition does not include zero. Therefore, statistically antifungal activity of Candida albicans is better in alcohol KLL extract than aqueous extract. In this study, both alcoholic and aqueous extract of KLL showed significant antifungal activities against Candida albicans and Aspergillus niger. The efficacy of antifungal towards the pathogenic otomycosis was noted solvent dependant. Candida albicans was inhibited better as compared to Aspergillus niger in both aqueous and alcohol KLL extracts. Scattered plot graph with linear line showing zone of inhibition of different concentrations of aqueous and ethanol Kaffir lime leaves extracts against Candida albicans and Aspergillus niger. As for Aspergillus niger, we noted there was antifungal activity towards Aspergillus niger but it was more remarkable in aqueous KLL extract as compared to alcoholic KLL extract, a total opposite to Candida albicans. Not many literatures mentioned on antifungal effect of KLL towards Aspergillus niger. Unlike Candida albicans, Aspergillus niger does not exhibit biofilm formation or adhesion composite resin. Some of the selected Aspergillus spp. are known to produce secondary metabolites or toxic substances that are capable of eliciting toxicity in animals and human.20 The pathogenicity of Aspergillus spp. closely related to these mycotoxins. Study by Thanaboripat et al. revealed that KLL extract at all concentrations had significant inhibitory effect on the fungal growth of Aspergillus flavus (p<0.001). Aspergillus flavus has the capability of producing toxic secondary metabolites, known as aflatoxin.21 Although Aspergillus niger does not have the ability to produce aflatoxin, this fungal produce almost similar mycotoxin such as 3-nitropropionic acid and ochratoxin A.20,21 Possible explanation regarding inhibition more in aqueous extract rather than alcoholic is depending on the bioactive constituent in the extract. Extraction using water as solvent will preserve certain substance which will strongly inhibit Aspergillus niger growth. Rammanee and Hongpattarakere evaluated on inhibitory activities of ethyl acetate extracts and hydrodistillated essential oils from five cultivars of tropical citrus epicarps against Aspergillus fumigatus, Aspergillus niger, Aspergillus flavus, Aspergillus parasiticus, and Penicillium sp. Among all citrus cultivars, only extract from kaffir lime inhibited the growth of all fungi tested. The result appeared to be more sensitive to the hydrodistillated oil than the ethyl acetate extract which suggestive that fungal growth inhibition is solvent dependent.22 In our study, antifungal activity of Aspergillus niger is better in aqueous KLL extract than alcohol extract (p<0.001). Despite of using hydrodistillated oil, we used other aqueous base extraction method using soxhlet apparatus that showed almost similar result. Kaffir lime contained multiple antimicrobial compounds with major constituents of citronellol, limonene, linalool, and o-cymene, correlating to its broad-spectrum inhibition.26 Combinations of limonene with other components such as citronellol and linalool may be responsible for the antifungal activity of kaffir lime because they were present in the significant level. In addition, many other minor compounds such as o-cymene, sabinene, β-myrcene, β-pinene, and α-pinene should not be ignored.22 The antimicrobial activity of these compounds was previously reported. Pure limonene at a concentration of 25 μl/l was reported to effectively inhibit Fusarium verticillioides.23 P-cymene has strong mycelial growth inhibition towards F. oxysporum and can cause destabilization of B. cereus cytoplasmic membrane.24 Other monoterpenes including citronellol, limonene, β-myrcene, β-pinene, α-pinene, and α-terpineol able to inhibit hyphae growth.25 Also, citronellal and citronellol were reported to effectively inhibit human pathogenic fungus, Microsporum gypseum, which is known to cause hair and scalp infections.26 Therefore, the inhibitory activity was contributed from the synergistic effect of both major and minor constituents present in the kaffir lime. KLL showed that the leaves extracts possessed remarkable antifungal activity against all tested fungi, evidenced by presence of zone of inhibition in both extracts for both fungi growth. Antifungal activity of Aspergillus niger is better in aqueous KLL extract than alcohol extract. In contrast, antifungal activity of Candida albicans is better in alcohol KLL extract than aqueous extract. Candida albicans was inhibited better as compared to Aspergillus niger in both aqueous and alcohol KLL extract. We would suggest that KLL able to achieve medical use as ototopical antifungal with low risk of ototoxicity. Furthermore, with easy availability of KLL in Malaysia, it can be cheap and environmental friendly source of medication. Usains Research Grant and USM Short Term Grant. Conflicts of interest CONFLICT OF INTEREST The authors are declared no conflict of interest. Shekhawat PS, Prasada R , authors. Antifungal properties of some plant extracts. Inhibition of spore germination. Indian Phytopathology. 1991;24:800–2. (1972). Keyword: Statistically antifungal activity of Aspergillus niger is better in aqueous extracts as compared to alcohol extract. In contrast, antifungal activity of Candida albicans is better in alcohol extracts as compared to aqueous extract. Candida albicans was inhibited better as compared to Aspergillus niger in both aqueous and alcohol KLL extract.